The same could be said for most of us. As we’ve become more aware of environmental and social justice issues, our consumer choices have become more complex and not always easy to implement. Only more recently have we started looking outside ourselves and our own interests. For me, David Suzuki was the catalyst with his passionate messages about the urgency of the environmental crisis caused by thoughtless and excessive consumption. He made me think. Not long after that, I read Naomi Klein’s book, No Logo, in which she exposed and explained the prevailing social injustice for workers in developing countries. I could not ignore her compelling description of the race to the bottom, the quest for us to have ever-cheaper goods with no consideration for the disadvantaged workers producing them. Somewhere along the way, I realized there is no going back. Once I knew about the ozone hole, global warming, acid rain, and sweatshops, I couldn’t pretend I didn’t. Would I change my habits? my curriculum? “Yes” seemed the only answer. Anything else would have been incongruent with my desire to make a difference in the world. Congruence is important. It is what reinforces the finer points of our selves. “The world we live in and the lives we make for ourselves do not happen by accident. When you are conscious in your engagement with the consumer culture, you are more likely to end up living a life that is congruent with what you really want. 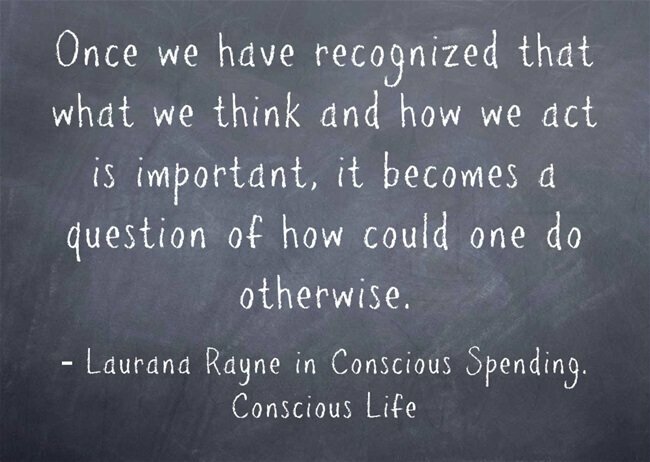 Once we have recognized that what we think and how we act is important, it becomes a question of how could one do otherwise.” (p 314, Conscious Spending. Conscious Life.) Congruent action is the cornerstone of conscious consumption. In many cases, conscious consumption requires effort. Sometimes it makes us uncomfortable—when we are mocked by others for taking a stand, when we wake up in the morning in a chilly house because we turn the thermostat down at night, when we wait for a bus on a freezing winter morning rather than driving to work. Why bother? Because even our small actions contribute to the greater good. One person turning off unnecessary lights is a small thing. But there is a cumulative effect if half the households in a community do likewise. The other benefit: our caring requires accountability from corporations. We have seen this more frequently over the past few years. When Anita Roddick founded The Body Shop in 1976 on principles of environmental and social responsibility, she was taking a radical stand. Today, corporate social responsibility (now dubbed CSR) is much more the thing to do. Corporate conscience has come a long way since the days when Nike was lauded for its “clever” strategy to distance itself from the appalling workplace conditions of people making its products. 2013 was “marked by audacious goals, new industry support, and unexpected partnerships” according to a report by Cone Communications. Their list of ten top trends in corporate social responsibility includes a focus on food transparency, viral visual storytelling, and guerilla cause marketing. We may be cynical about such corporate initiatives because some companies undertake them just for good optics. But, you know what…it creates more choice for those of us who want to consume in alignment with our values. I don’t know where Neil Young stands in all of this. Perhaps, as Licia Corbella suggests, he is a hypocrite. On the other hand, by speaking out he is doing something. And that is the least any of us should do—something. This entry was posted in Walking the Talk, All Posts—newest first and tagged conscious consumption, walk the talk, corporate social responsibility, environmental crisis, David Suzuki, Neil Young, sweatshops, congruence, sccountability by Laurana Rayne. Bookmark the permalink.